All transactions are safe and secure with a reliable history in online purchasing behind each of our associates. 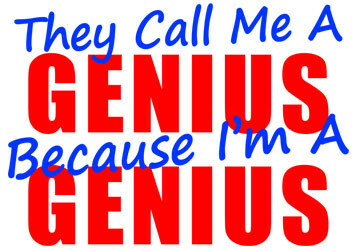 Buy the They Call Me a Genius Because I'm a Genius t-shirt to own Big Bang Theory clothing and merchandise. During the episode "The Pork Chop Indeterminacy", Sheldon's twin sister Missy Cooper (Courtney Henggeler) pays the gang a visit when she's in town for a wedding. She stops by "Shelly's" apartment so that he can sign some papers pertaining to their father's estate. When he reminds her that she could have just mailed the papers, Missy replies, "I guess that's why they call you a genius." Sheldon retorts with the quote on the front of this tee, "They call me a genius because I'm a genius." In addition to the They Call Me a Genius Because I'm a Genius tee above, browse the Big Bang Theory Clothing Gallery for more apparel like men's and women's clothes, kids shirts or hoodies.